This one was absolutely beautiful. The writing and tone was flawless, giving me the impression of it being 18th Century Venice while also telling me a love story that spans the test of time. I loved the musical aspects of this with the breakdown of how the music needed to be played and what both Adriana and Vivaldi wanted out of the music and the response they got from the instruments. This was such a beautiful romance and I just ached for the two of them. But I was also glad to see Adriana grow and realize that while she could still love Vivaldi, she couldn't be with him in the way she wanted, meaning she had to move forward. 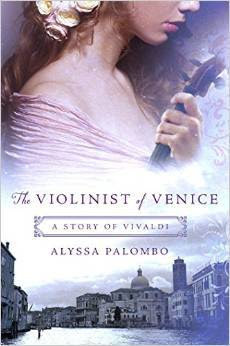 I thought how Palombo created the story could have been a very plausible explanation for Vivaldi's downfall and his interest in Anna. I would have liked a little bit more from him perspective or at least more updates on what he was doing in his life during the times when Adriana wanted to move forward and have nothing to do with him. But otherwise I enjoyed the pacing of this, I liked the slow build of their relationship to start out and that the consequences of their actions were shown and dealt with over the course of their lifetime. This was just so beautiful and I cannot say enough good things about this. Thank you so much to St. Martin's Griffin for allowing me to read this one before it's release. I am just in awe of Palombo's writing and storytelling. I cannot wait to see what else she writes. I haven't been reading much so I had to pass up on this one but wow it sounds amazing! This sounds like one of those perfect romance novels! I love the idea of this one being a secret, forbidden affair and both members of the couple loving music. I want to try this one myself, and the cover is just lovely too! First of all, that cover is beautiful. Second of all, can I say how interesting this book sounds? I mean, I don't really do romance books, but this one just calls my soul and ah, it sounds so beautiful! I think I'll add this one to my tbr with hopes I can get it some day. Great review!